This modern apartment, built in 2015 is full of light and its two balconies is providing a sunny dinner spot as well as a nice barbecue and lounge aria. The connected kitchen and living room havs a lovely dining table with the barbeque area close. In the living room there is a home cinema with sound system and nice relaxing couches. One marble bathroom have both a bathtub and a shower. The washing machine and dryer are new and there are lots of space for your things. The other bathroom have one shower and a toilette. The bedrooms are practically furnished with new beds. All in nice colours. The apartment is situated on the 4 floor in a quiet area. It takes 5-10 minutes to walk to the city where the exclusive shops and excellent restaurants are situated. You can by your fresh bred around the corner or have a nice breakfast in a caf'e. There are beautiful areas for a walk in the woods 3 minutes fr.o.m the apartment door. The subway and the buses are both in less than 3 minutes walking distance. The kitchen is very well equipped with modern machines. The Sony system in connected to all rooms including the bathrooms. I am married to Jonas since 17 years and we have 2 boys, 13 and 15 years old. We are both entrepreneurs and work a lot but we love it. The boys play football when they don´t studie or hang out with friends. On our spare time we often go to our house in the archipelago. We have to small dogs so walks in the close by area is a thing we do a lot:) We love to cook and have dinner partys, witch this apartment is great to have in. We like to see the neighborhood grow and take form and the fact that its so close to both the city and the nature is important to us. The design and architecture is very nicley done with a good feeling for material and the outdoor areas are nice and green. The apartment is situated next to the Royal College of Music witch gives the area a living atmosphere. The open floor plan gives the apartment a sence of air and space. Its a great place to cook and have dinner in because of the open aria and your guests can keep you company sitting at the kitchen island chatting. Its a welcoming nice place to be and we hope you will enjoy it as much as we do. In 7 minutes walking distans you are down town with all restaurants, bars, museums, sightseeing and great shopping. Everything from the big brands to small shops with unique things. Stockholm is located so that we are surrounded by water. Visit the old town with all the ancient buildings and the castle, all by the water. Stockholm has many different villages in the city with there own characters. A nice fireplace that goes on gas that you fill two containers with. It gives a nice and cosy atmosphere. For an extra fee to cover costs for washing. A big dinner table is in the center with comfortable chairs and cosy lightning. Great location with easy access. Airy, bright and comfortable and very quiet area. Perfect for family of 4 on a 4 day visit to Stockholm. I've never been so pleasantly surprised by a vacation rental as I was with this gem. Yes the photos are nice but they don't do it justice - this apartment is so light and bright and spacious! There are balconies all around it that we would have our morning coffee or glass of wine on the evenings. Everything was so clean, well laid out, and very trendy décor. If you love music and entertainment as we do the Sonos system and the drop down theatre screen was incredible and made us all so happy to watch football. The location was so perfect - in the upscale part of town with sushi restaurants, trendy cafe's, and a workout club all on the same block. 100% recommend this place and when we return (we have family living in the area) we will hope that this place is available and we will stay again in a heart beat! Lovely, well-appointed space in excellent proximity to Stockholm sights and delights. We enjoyed being immersed in the neighbourhood. Hosts are attentive to the guests' needs. Highly recommend as an option when in Stockholm. Beautiful, spacious apartment in great location. It was a great pleasure staying in Jenny´s apartment. Besides from being beautifully furnished the apartment is s well equipped, spacious and well located. Jenny is an attentive host and made us feel welcome in her home. Thank you Jenny and family for letting us stay, we can highly recommend the apartment for a great stay in Stockholm! Thank you Helga for kind words! I am so pleased that you enjoyed your stay. Fantástico. El apartamento esta muy bien y la localización es buena. El apartamento es preciso, muy acogedor, con todas clase de comodidades, bien equipado y está muy bien situado. En la zona hay bares, restaurantes y supermercados. Tiene una parada de metro a 2 minutos de la casa. La propietaria es muy amable y atenta. Hemos pasado nos días estupendos en Estocolmo. Perfect apartment in a great location !!! We spent a week with our three children in Jenny's apartment and loved it. 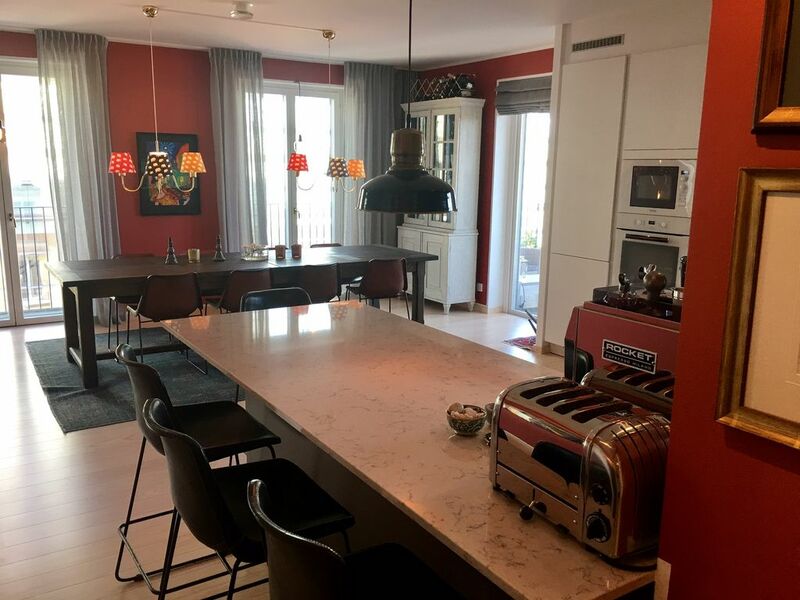 The location is perfect (only 50 meters to the subway entrance, two stops to the central station, bus stops within walking distance), the apartment is very comfortably furnished and very well equipped. We were traveling during the day and enjoyed the evenings in the apartment. Next door, more residential buildings are built, but we did not find this disturbing. It was rather that our children stood by the window in the morning and watched the construction work with interest. Apart from that we were always on the road during the day. We can fully recommend the apartment. We have 2 great bakeries to by fresh bread in the morning at and a grocery store 3 minutes from the door. If you take a beautiful walk for about 20 min you reach the royal park called "Djurgården" its a big green area with many restaurants, a botanic garden and museums, a tivoli called Gröna Lund, and lovely walks along the water. A good way to explore the archipelago is to go with one of the boats from Strandvägen. Stockholm has a great variation of restaurants. Everything from lovely seafood (Wasahof on Dalagatan 46, buss 4 about 8 minutes, Sture Hof at Stureplan, 7 minutes walk from the apartment) to asian food, cross over and Italian (Trattoria Montanari on Grev Turegatan 56, 5 min walk from the apartment or Restaurante Esperanza on Drottninggatan 77 bus 1 about 10 min). If you want to visit a castle you have a lot to choose from. Visit a sigth called "visitstockholm.com" for more information. If you would like to have a great cocktail and royal atmosphere visit Grand Hotell and the Cardier bar at Södra Blasieholmshamnen 8. If the weather allows it, visit one of the rooftop bars around the city. "Tak" has a wonderful wiew over the modern city and Mosebacke Terassen over the old town and Djurgården. Some other is Dramaten facing Strandvägen and the boats and Scandic Sjöfartshotellet.